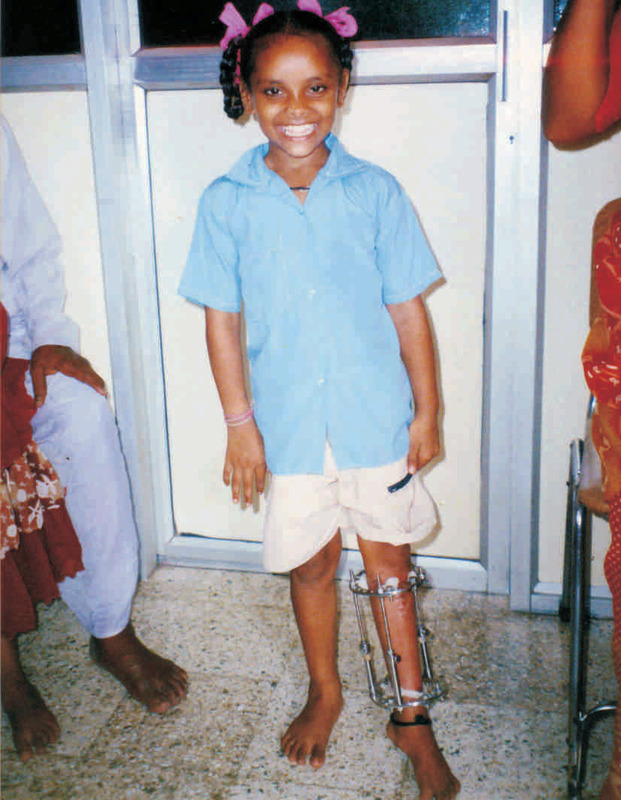 Child & Family Welfare Foundation is based and operating in Mumbai, India providing ‘Free Correctional Treatment’ to children and young adults who are suffering from deformities, mostly as a result of Polio and Cerebral Palsy. Though overall Polio has sharply decreased, mainly due to immunization campaigns, there are still a great number of Polio victims in India, many thousands in our region alone. CFWF is carrying out its project with Dr. Paresh Desai and his Shraddha Ortho Clinic in Mumbai. Being a renowned specialist in orthopaedic surgery of deformities, Dr. Desai has committed himself to offer his services and skills at a cost to cost basis for the poor, disabled children and youth. Trained volunteers of CFWF regularly survey slum areas, sometimes under difficult circumstances, to locate disabled, crippled children and youth, and then register such needy children with our project. There is also a network of associates, friends, and social workers residing in and near slum areas, which work with CFWF and help coordinate our efforts. We put emphasis on getting to know patients, their families and circumstances thoroughly, which enables us to serve them better and have the right basis for a successful treatment. The first step is for each patient to receive a free medical check-up at the clinic of Dr. Desai. When medical exams suggest that surgery will be beneficial, CFWF lists a patient for treatment. Those who are economically bad off will receive free-of-cost operations under our sponsorship program, others may be requested to contribute minimal amounts towards surgery and treatment. Depending on the degree of disability, patients require one or several stages of surgery, while other may only need minor surgery. We explain to patients and their families what it involves, how much time the treatment will take, so they are aware and can be prepared. All medical decisions are taken by the doctor and his hospital. CFWF personnel are knowledgeable of medical matters, but acts only as advisors and Coordinators. We consult patients’ families, coordinate children’s treatments; at times transport them back and forth to the hospital. Out of station patients are requested to arrange their own accommodation, so that may be required to present for a prolonged period during treatment /medical exams. CFWF volunteers communicate regularly with patients, make follow-up visits in order to monitor the progress of their treatment, and assist them quickly should problems arise. The time of recuperation is important and it is often then that friendship and trust are built. During this stage of treatment we have opportunities to educate these families on sanitary, medical and nourishment matters. We also distribute clothing and other useful items to them, whenever available. During the postoperative stage we prepare patients for the next step, which for many of them will be important; to begin with Physiotherapy, especially those affected with Cerebral Palsy. Often patients require Physiotherapy after each stage or surgery and in particular towards the end of the treatment. Depending on the need we coordinate their sessions with the right therapist, instruct and supervise additional follow -up exercising at home. Permanently assist them in their walking and moving about. We work with the OAALMAC institute in Mumbai, which specializes in manufacturing lightweight crutches, shoes, braces, walkers and various types of callipers. CFWF is sponsoring these items for patients as part of the Free Treatment project. An important aspect of our commitment is that patients can always come back, contact us later on for additional free medical check-ups, repairing and replacement of their Orthopaedic Aids, as the need arises. Child & Family Welfare Foundation is assisting very poor patients and their families during treatment with additional financial support beyond surgery and treatment, such as transportation, extra medical expenses, as well as contributing toward their living expenses in various forms. After successful treatment we act as counselors and advise patients in how to proceed in educational and career matters, as many of them had lacked basic education due to disability. This last step is the ultimate aim and goal of this project. Building hand in hand with each patient a better future with full integration into society.